It started with the Kwik Trip. I usually stop by the neighborhood Kwik Trip convenience store for coffee on Fridays. Today, they were out of hazelnut, my preferred flavor. I took Kona blend instead. I should have stopped right there and gone home. But no, I kept plugging away. I headed to work, Kona blend in hand. I made it to my cubicle without incident and turned on my computer. That’s when this happened. Oh, dear. This looks serious. 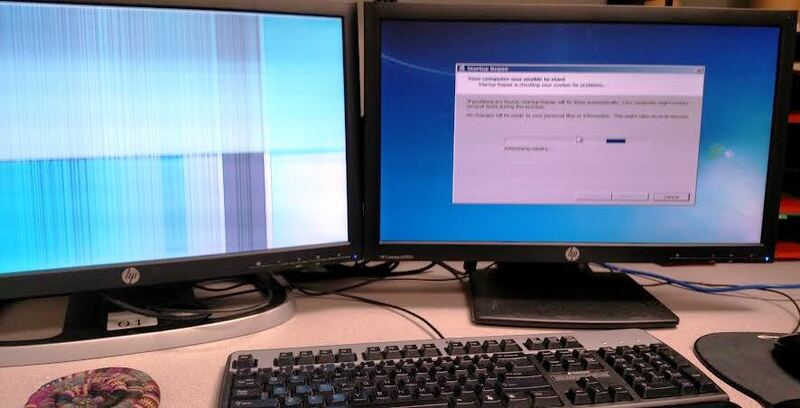 When my computer finally came on, I emailed these two pictures to Helpdesk. She promised help right away. The techie (an intern, it turned out) came up within minutes. He rebooted the computer to watch the show, and guess what — nothing happened. 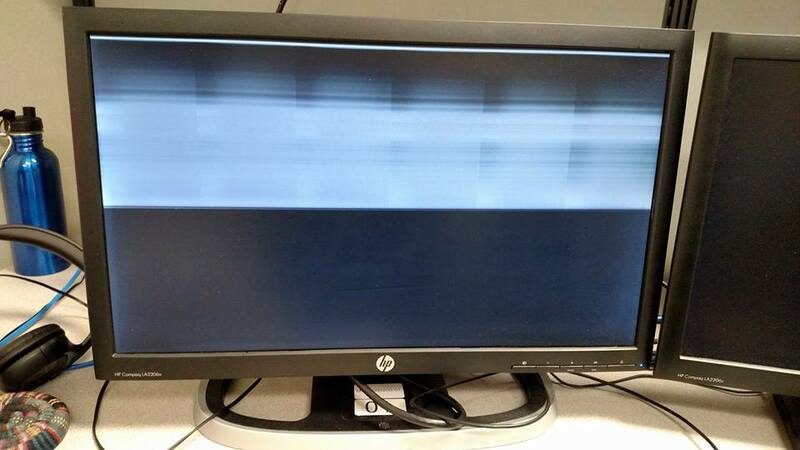 So after my morning classes, I walked away to get my attendance from the printer, and when I came back, the computer had shut down. On its own, it had quit. 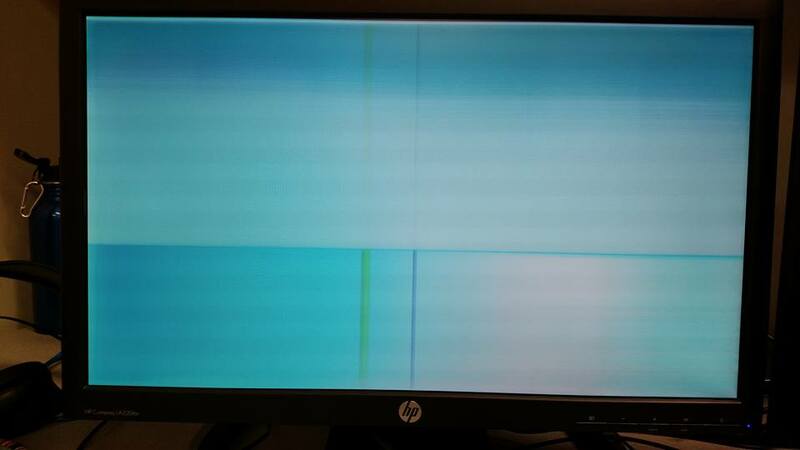 Neither monitor was on. I turned it back on, and the light show began. I took video this time. The blue-green phase lasted almost 3 minutes. I gave up and called Helpdesk. I reached the voice mail. I left a message with my name and location, yada yada yada, and then wandered off to have my own lunch (sushi — we’d ordered out). My chopsticks broke. I got a sliver from one of them. And I didn’t get a fortune cookie, either. That’s what happens, I guess, when I order Japanese sushi from the Chinese restaurant. I should have given up then. But no. I still had one more class to teach and a number of phone calls on my to-do list. I moved to an unoccupied cubicle, logged into my classroom, and finished the afternoon. After that, the principal told me IT had been back, replaced a cord, and left. I refrained from jumping up and down and cheering, and turned on the computer. One. More. Time. Eventually, the reboot finished, and all appeared to be well. I made a few phone calls, cleared my email inboxes, wiped down the entire desk with cleaning wipes, and turned everything off. Monday, if they’re out of my coffee at the Kwik Trip, I might just turn around and go home. This entry was posted in Random Thoughts and tagged teachers live at school by Daisy. Bookmark the permalink.